Spring is just around the corner, and dog parents are thinking about heartworm and flea and tick protection. Work with your veterinarian on the most appropriate treatment. Many pet parents are also looking for more holistic and natural treatments. Traditional and holistic treatments can work together and both can be effective. Answer: Mosquitos and ticks are not typically a problem when there is snow on the frozen ground. It is more important to medicate dogs during peak seasons of the warmer months. However, if your dog is in the woods and brush or in other high-risk areas on a frequent basis, your veterinarian can guide you on the best treatment protocol. There are new natural treatments for flea and tick in the form of sprays and oils and other options. Any time our dogs don’t need to be on medication is good for their general well being. Work with your veterinarian and consider your dog’s overall health when pursuing any treatment. Dogs and music go together. Recent studies show dogs prefer classical music to other genres. Humane shelters are playing music and dogs are responding by barking less and exhibiting less stress. Then there is that dog who will howl and seem to sing along to the music. A dog’s hearing is more sensitive than ours, so loud music could be more stressful for them. Answer: Yes, if you leave a music station on that plays classical or even contemporary instrumentals, your dog may like it. Other genres may be stressful for them. Make sure the volume is low because of your dog’s sensitive hearing. In addition to being soothing, it also drowns out natural noises like traffic and other loud sounds that may cause dogs to bark and feel stressed. Having said this, if your dog does not like listening to music, don’t put it on. Sound machines are a great alternative. You may find a select sound your dog enjoys. Competitive Dog Dancing is a worldwide sport. Watching these teams perform is fascinating. Yes, dogs and music can be wonderful together. Donna Chicone is an award-winning author, TEDx speaker and advocate for dogs. She is a former nurse, family and addictions counselor, 23-year corporate America professional, and host of Jazz and Jive’s TV Show. 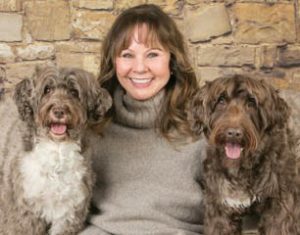 She is a devoted pet parent to her two Portuguese water dogs, Jazz and Jive, and is an advocate for the humane treatment of animals. She lives in Minnesota with her husband. When she is not writing or speaking about dogs, she’s engaged in pet assisted therapy work and K9 Nosework with Jazz and Jive.